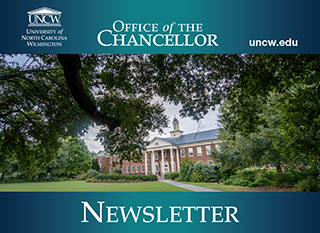 In March, UNCW welcomed both Gov. Roy Cooper and Dr. William L. Roper, interim president of the UNC System, to campus. These state leaders were impressed by the commitment to excellence that our campus community has made, and they are eager to see the university continue its recovery from Hurricane Florence. We have made great strides, but there is still more work to be done to help all of our people and programs continue to soar. UNCW is springing forward on plans to enhance and expand our campus. We opened the Administrative Annex, a 34,000-square-foot space on MacMillan Avenue, completed a new parking lot near the annex, finished many hurricane-related repairs over spring break, and continued construction on Veterans Hall and the Student Housing Village. Next month, we will begin work on a new Applied Research Learning Facility and additional modular lab units, designed to support academic areas affected by the damage Dobo Hall received during Hurricane Florence. Visit uncw.edu/campusconstruction for more information. This month brought many accolades to UNCW faculty, students and staff, including psychology professors Raymond Pitts and Christine Hughes, who received a $446,000 grant from the National Institutes of Health to conduct opioid research. Fulbright Research and Teaching Award recipient Narcisa Pricope, associate professor of geography, was named the first recipient of the Distinguished Emerging African Scholar Award by the American Association of Geographers. Amanda Ceroli ’19 also received a Fulbright Research Grant to pursue a graduate degree at the University of Southampton next fall. Jay Richardson '20 was awarded a Google Student Veterans of America Scholarship, one of only eight recipients nationally. Melinda Anderson, associate dean of undergraduate studies and director of University College, has been elected to the board of directors for a global community for academic advising professionals. Professor John Morrison shared the first ocean color image captured by Seahawk-1, the nanosatellite UNCW launched in December 2018 in partnership with NASA, ACC-Clyde, Cloudland Instruments and the Gordon and Betty Moore Foundation. As these Seahawks' accomplishments clearly demonstrate, UNCW's dedication to academic scholarship, community service and student success is inspiring great results. See UNCW's Strategic Plan to learn more about the mission, vision and values that are guiding our growth. Favorites: Chancellor Jose V. "Zito" Sartarelli Ph.D.